A home in Old Bridge, New Jersey known for its extravagant holiday light display is being threatened with a hefty tax this year because of safety hazards. An annual extravagant Christmas light display in Old Bridge, New Jersey, is being threatened to be shut down this year by local officials who say it causes unsafe conditions in the neighborhood. Now homeowners and Old Bridge natives Tom and Kris Apruzzi have turned to GoFundMe to raise the $2,000 per night required by local police and the town's mayor to pay for police security. "For 15 years Thomas and Kris Apruzzi have been putting on a Christmas Light display which has become a tradition not only for their family, but for many families in Old Bridge and neighboring towns," the GoFundMe page reads. "Residents will tell you that they were brought to the Apruzzi house as kids and now bring their own kids to witness the amazing display." By 1 p.m. on Wednesday, the GoFundMe page had raised nearly $1,300 donated by about 40 people. But if the show will go on, the family will need to raise at least $8,000 per week for the police fees and $4,000 per week for a shuttle service to will bring visitors to the house from a local school. The page is asking for $75,000 total. The Apruzzi family told the Bridgewater Courier Times they have been putting on the annual show for 15 years, and start decorating in July. The display features tens of thousands of lights and cost about that much, too. The family members also say they collect donations from visitors to the display for organizations like Home for Our Troops, St. Jude's Hospital and the Old Bridge Police Benevolent Association. The ordeal is causing a bit of commotion of social media. NJ.com reported the Christmas decorations can draw up to 1,000 people per night. In years past, local police have had to intervene after they received complaints from neighbors about traffic and noise. As a result, the Courier Times reported the Apruzzis intend on only turning on the lights on Thursdays, Fridays, Saturdays and Sundays between 6 p.m. to 10 p.m. from Dec. 1 through Jan. 1. Regardless, the mayor and police said they intend to shut him down if they aren't paid. "We said no," Thomas Apruzzi told the Courier Times. "It's my First Amendment right — my freedom of speech and my freedom of religion. I am a Catholic and I believe very much in Christmas. That's how I express myself — through my lights. There is so much negativity in the world that if I can make people happy just one day, why not?" The Christmas light show will be all lit up — funds or no funds — on Saturday, Dec. 1, even if the money for security has to come from Apruzzi's own pocket. 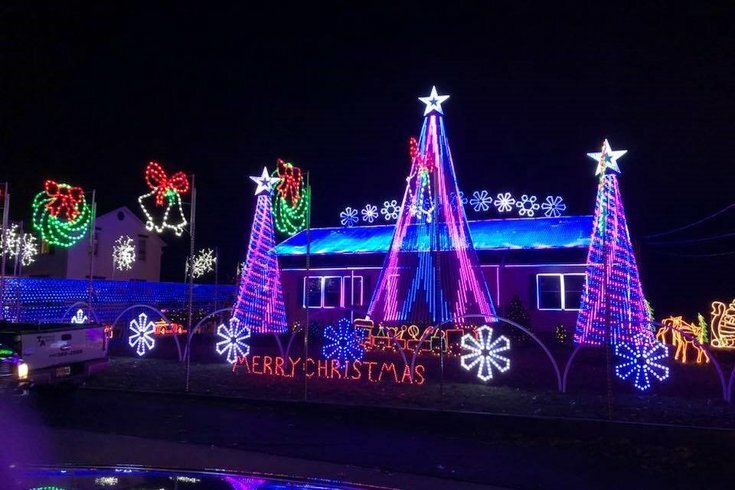 "The Apruzzi family is so passionate about sharing their light show and dedicated to continuing the annual traditions for their neighbors as well as Homes For Our Troops, that Thomas is determined to fund the first couple nights out of his own pocket. Please help Tom and Kris continue this holiday tradition this year!"